People travel from all over the world to experience what we have on our doorstep in South East Queensland. Gorgeous North Stradbroke Island is just an hour Ferry ride from Brisbane, but when was the last time you visited? Straddie, as the locals call it, has everything you could want in an island holiday – beautiful beaches, wildlife, history, lovely locals and of course endless island vibes. It’s the World’s second largest sand island and there’s no shortage of things to do here, but to make the decision making a little bit easier why not join a tour that takes in the best the island has to offer. Tim Cooper runs Shakas Adventure Tours, where he connects guests with Straddie locals who have their own story to tell. One passionate local is Mark from Straddie Adventures – he shares his Quandamooka heritage with visitors through guided cultural kayak tours. Tim runs a variety of one day and weekend tours, and he’ll customise it to your adventure-level. The “SOAK IN THE ISLAND VIBE” tour takes in the natural beauty of the island, including a visit to Straddie’s top beaches and some on-water fun in the form of paddle-power. Chris Semple runs guided Stand Up Paddling tours around the island and he’s one of the lucky few that can say he grew up here in paradise. The SUP tours suit all fitness levels and take guests to a gorgeous, untouched part of Stradbroke that not many people visit. Everywhere you turn on Straddie there’s another speccy spot, and Point Lookout is one of the most iconic…for good reason. You can spot dolphins and whales in the water, say hi to kangaroos grazing and snoozing on the grass, and enjoy a walk or run along the spectacular North Gorge track. It’s certainly paradise on our doorstep. If you’d like to “soak in the island vibe” for yourself, the Shakas 2-day tour starts at just $229 per person – that’s for transfers from Brisbane, guided island tour with Tim, paddle tour, meals and one night’s dorm accom. But you can personalise every tour, so why not upgrade to Minjerribah Camping’s new Glamping tents at Adder Rock. This is getting back to nature in style, a few steps from the beach and Point Lookout. The campgrounds offers a range of accommodation options, from tent sites, to cabins and high-end glamping. The gorgeous glamping tents are a fabulous alternative to having to bring all your own camping gear over to the island, and yet you can still enjoy a lovely, natural, authentic experience. 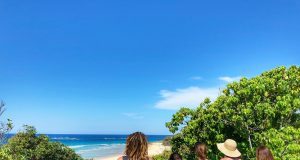 While one day on North Stradbroke Island is fabulous, a few days is even better…so do yourself a favour and plan a visit.